Wordless Wednesday pictures from an August 2012 post. . .
Click on any thumbnail below and enjoy. The garden and view from the patio on the first of three terraces. A small pond is hidden by the arbor. The view from the pond. The area is planted with lamb’s ear (Stachys byzantina), Russian sage (Perovskia atriplicifolia), and a bright green small creeping sedum. You can also see the spent stalks of naked lady lilies (Lycoris squamigera) and some irises. The arbor, built by my father, holds Clematis montana. In the foreground is beautyberry, Hellebores, and wild violets. The center holly has been limbed up by the deer. My father also built the stone retaining walls, using stone from the woods. On the top terrace (hidden by the arbor) is a patio area covered by a pergola. Clear filament protects Viburnums and Hostas. The dark green plants in the background are Hellebores. Hellebores border a path from the woods to the pond. 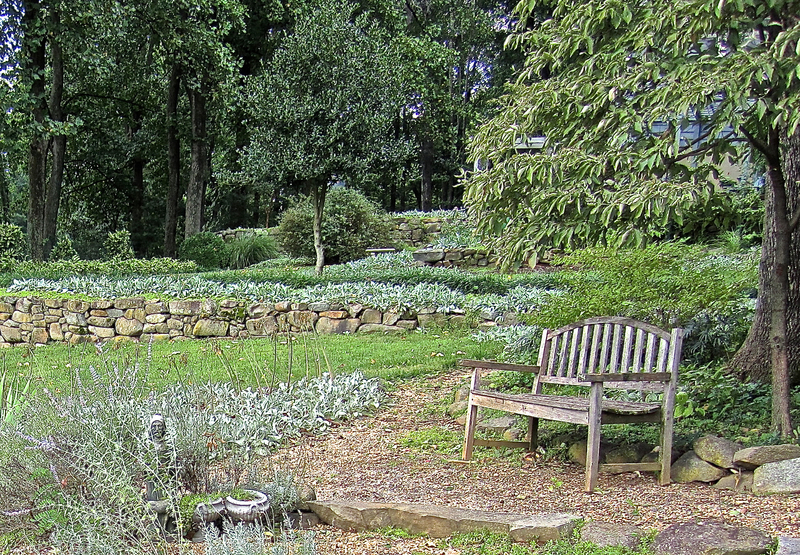 A tall persimmon tree and a perennial bed that covers the site of an old sinkhole. Beyond is the old Christmas tree farm. The view of distant mountains. Sophie hunts in the Miscanthus; a grove of persimmon trees is in the background. A birdhouse surrounded by Buddleia, goldenrod, and Miscanthus. Looking down from the top terrace level and pergola. Stepping stones with the imprints of grandchildren’s hands and feet. The holly over the bench was limbed up by the deer. A high fence protects the vegetable garden. We brought this sculpture made from old auto parts back from Niger. We are so touched by this blog. We loved it. It was nice to look at these pictures again. Long live the lamb’s ear and Russian sage! 2011? Is it still your mother’s garden? Or a memory of once was. It is still their garden — still looking beautiful. I am not really gardening here in Germany. We are concentrating on traveling as much as possible. Beautiful garden, Cindy I guess we know where you got your interest in garden design. Did you have any role in creating this garden? Is it still your parents’ garden? Really lovely setting too with the surrounding views. I have not had anything to do with this garden’s design — apart from donating some bulbs from yards we have moved away from (and there are some boxwoods in this garden that have been to my house and then come back again after a move). About 25 years ago, the grandchildren did distribute a couple of seed packets of annuals that still return every year. What a super garden – such a feeling of peace, even although we are only looking at photographs. I think all the blue tones in the foliage (and the hills) contribute to the peaceful feeling.